SAP Cloud Applications Studio help customers and partners comply with the data privacy regulations for the extensions created on top of standard delivered solution. More details about these standard functions on data privacy is available in this blog. With the 1711 release, you can control the data disclosure and data removal of personal data maintained in the custom business objects. The custom objects need to have a one-to-one relationship with Individual Customer, Contact Person, Employee, or Service Agent. When you trigger the data disclosure for an individual customer, contact person, employee, or service agent, you will be able to view the data maintained for that entity in custom objects as well. A data privacy officer can initiate the data disclosure using the Data Privacy Management –> Personal Data Disclosure work center view. 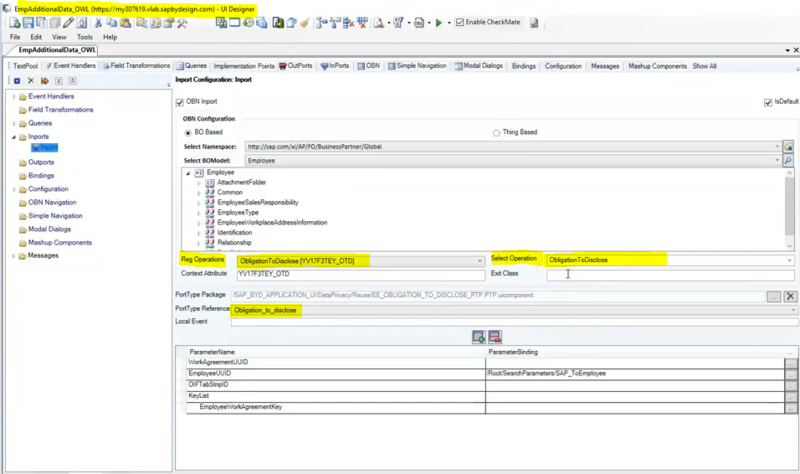 Please follow the steps in the below video to enable this using PDI. The data privacy officer can also initiate the deletion of personal data using the Data Privacy Management –> Personal lData Removal work center view. The deletion process will also consider the data maintained in custom business object and anonymize it like with other standard data objects. You can enable this for a custom object by implementing an enhancement option as explained in this video. When I create an OBN BO based inport, the only Reg Operation I see is “Open”. Any views on how I can fix this? 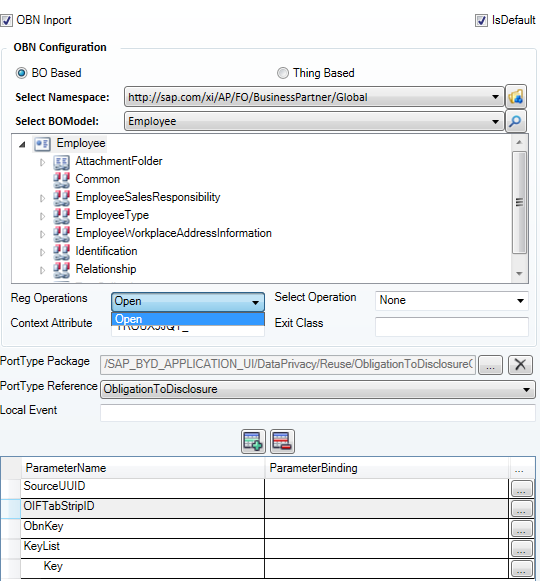 You need to keep the Reg Operations as Open, however you need to choose the Select Operation as ObligationToDisclose. Thanks for your reply. The screenshot from your video shows that both, Reg Operations and Select Operation are set as ObligationToDisclose as below. 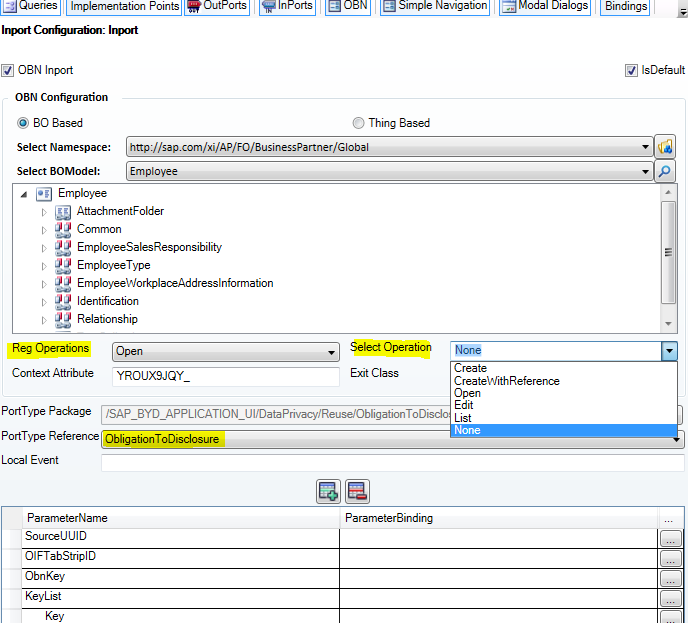 On my solution, I do not see ObligationToDisclose even under Select Operation. Seems like something is missing as even the Parameters seem to be different on both screenshots. Reg Operations can stay as Open. You can type the value for Select Operation – It has to be ObligationToDisclose. Do you know the the OBN inport settings for the Customer as well? Very nice tutorial. I was able to complete all the things except one. I can see the count of custom BO documents in Data Disclosure view. But when I click on that hyperlink of my PDD profile, the target screen does not show me any record. How is this to be implemented?